The Dive Shack offers regular boat diving charters throughout South Australian Waters. We have the capacity to conduct dive charters at any location in South Australia’s vast array of dive sites with our purpose built dive vessel, the Nauti-Nomad. 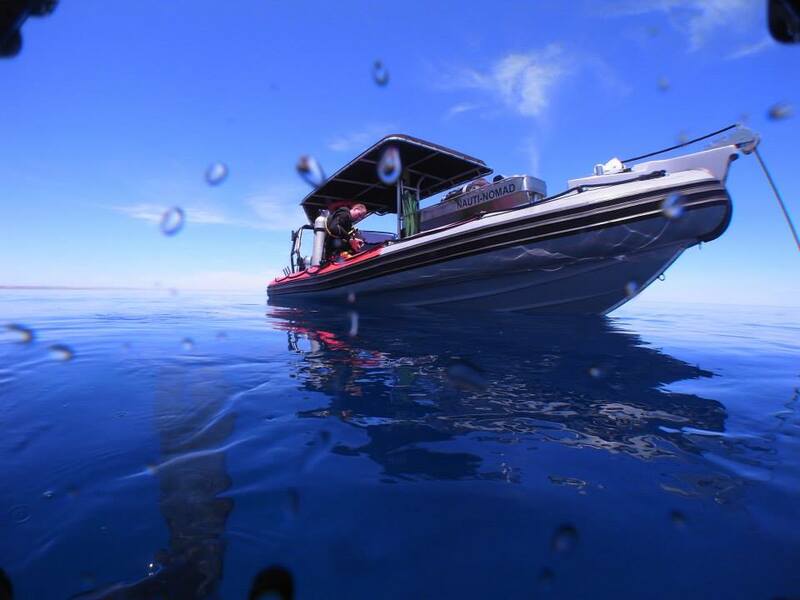 The Nauti-Nomad is a GEMINI Waverider 730 Rigid Inflatable Boat (RIB) and is regarded as one of the best RIBs ever produced. GEMINI hulls are built to achieve perfect hydro-dynamic efficiency to soften each ride. The Nauti-Nomad is in current 2C survey and has the capacity to take 10 divers on a double dive in extreme comfort. It is purposely built for diving and comfort and has two Honda 135 HP 4 Stroke engines, that have minimal noise and no fumes. With its non slip deck, erectable sub shades to provide UV protection and shade during your surface intervals and ample storage, you can go dive anywhere, at any time in any conditions! We are confident that whether you dive in the South East, around Adelaide, on the Yorke Peninsula or the West Coast, your experience will be a memorable and enjoyable one with the Nauti-Nomad! * Please note that it is recommended that you invest in and utilise your own equipment for maximum enjoyment. The Dive Shack’s friendly shop and dive team members are happy to assist you in choosing your equipment. If you would rather hire your equipment, you are more than welcome to do so. We offer incredible discounts for all of our Boat Divers. Hire a full set of gear including 2 cylinders for only $65. Please see our rates for hiring equipment. Please see our calendar for our weekly boat dives. If you have any special requests* or would like to go somewhere in particular, please contact one of our friendly shop team members by phone or send us an e-mail. We conduct weekly double boat dives on both weekend and weekdays and can cater for local dive sites or night dives on every day of the week on request! * We are more than happy to do club or group bookings.